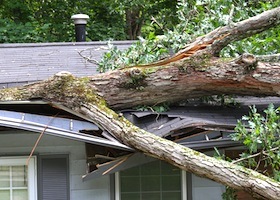 Severe wind damage from storms can knock down branches and trees around your home or property that can unexpectedly damage your home’s roof, windows and siding. It is important to stay away windows during storms with heavy winds. Your safety is our number one priority. If your home is damaged during a wind storm, it is important to make repairs immediately. If your home remains in disrepair, the damages to your home could be exponentially worse and repairs would be more extensive. Keeping your home in good condition is the best way to keep your family protected during a storm. Talk to our experts about your home and how to stay safe during a wind storm. All Storm Solutions is the #1 company for restorations and repairs in the Chicago area. All repairs will be evaluated on site, and then we can have a better understanding of what needs to happen to repair the damage. Our experts are highly knowledgeable about wind damage and how to stay protected during a storm. Ask them any questions you may have about the damages caused by the wind and the repairs that will need to be made to your home. You can feel safe knowing that with our years of experience and expertise, we can repair your home back to its original condition, and prevent further damage from happening in the future. When severe wind causes damage to your home, call All Storm Solutions for repairs and restorations that you can count on!